What an extraordinary year 2016 has been but probably the less said about all that the better. Right now, here in the foothills, we are enjoying the typical weather of this time of year; sunshine and blue skies, with frosty mornings, warm days and chilly evenings best spent in front of the fire. 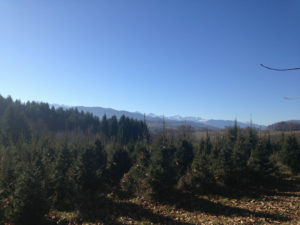 This is such a perfect location for Christmas because, while down in the valleys, we can make the most of the mild days, we also get the pleasure of looking at the snowy Pyrénées on the horizon with the promise of skiing, snow-shoeing and sledging just a short drive away whenever we feel like it. The French have got Christmas just right in this part of the world; they manage to take the best bits, discard the stress and overspending and focus on eating, drinking and enjoying time en famille. The last few months, it has been very evident that there has been a change of focus in terms of French property buyers; the majority of my property search enquiries lately have been for mountain barns, eco-properties and hidden valley houses with lots of land, surrounded by natural resources. It makes me think that many of us are looking for somewhere unspoiled and beautiful that feeds the soul, where we can feel safe and self-reliant whatever the next few years bring. I am certainly not making any predictions for 2017 save to say that, if you are looking for a better quality of life in general, then France still offers that in spades whatever the time of year and whatever is going on elsewhere in the world.